I'd almost stopped drawing. I mean, I still took my sketchpad out to work on roughs or to plan patterns, but I didn't really draw if it wasn't the beginning of a collage. And the less I drew, the less confidence I had and the worse I felt about it, like I was only pretending to be an illustrator and, sooner or later, someone would find out. Everyone would say, "Well, she might be able to collage a fine gazelle, but did you know all her sketchbooks are actually full of lists?" 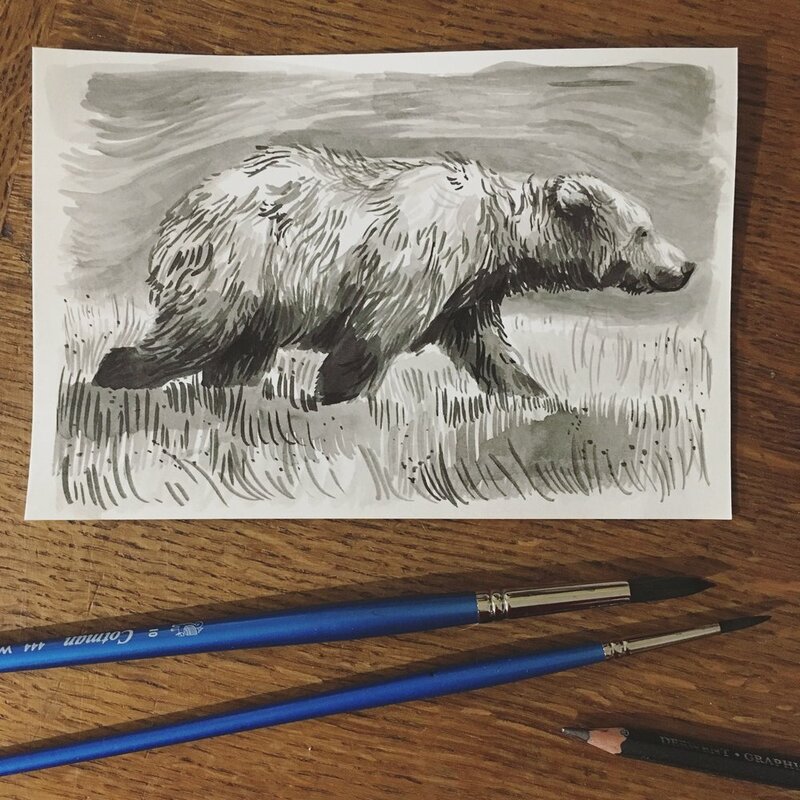 Last week I heard Eddie Mair interview artist Claire Parrish, about how she'd begun drawing again after years (it's a great story, you can listen here on PM, about 40 minutes in) and something made me stop worrying about all the other things I should be doing instead and pick up my pencil. After that tiny beginning (and proving that Gladys is always the answer) I didn't really want to stop. 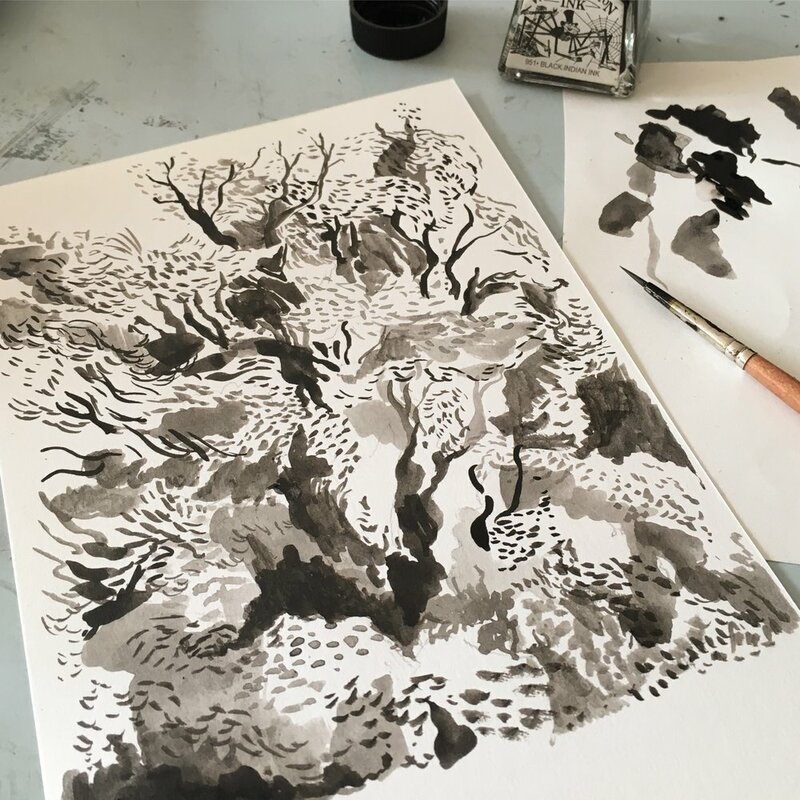 I can't describe just how perfect a weekend I've had, sitting in the sunshine, in the garden or at the top of my studio steps, drawing trees and things. Not brilliantly well, it has to be said, but that is beside the point. I think this must be what people are talking about when they enthuse about the benefits of mindfulness; feeling there is nowhere else in the world, and no-one else in the world, you'd rather be. It's quite a revelation, as though my mind is gently rewiring itself and I'm settling back into my skin. If I needed another reason to fall back in love with the humble coloured pencil, it would be that they're so portable! Even if I attempt to take all my collage things outside, it takes only the lightest breeze, or a mere wag of Gladys's tail, to send everything floating off into the grass. This whole pencil and paper thing is revolutionary. And Gladys can sit as close as she likes. OK, so I've only done their heads, but I'm happy with how they've turned out for now. I left the Highland out in the end because it wasn't quite right - disproving my theory that the hairier the animal, the easier it is to collage! Most importantly, my dad successfully identified all six different breeds, which has got to be a good thing. These cows are now destined for mugs and tea towels, and I've just had some new wrapping paper printed too! PS. Here's a cow from a year ago with a body. Just so you know I'm not always that lazy. Strange to see how my style is developing too, even in such a short time.